When it comes to drinking wine, there is a fair amount of protocol that one should follow, and that would include using the right kind of glasses, not to mention ensuring that you let the wine breathe before you take a sip, swirling it around your glass at the same time. There are others out there who do not give two hoots about such “tradition”, thinking that it is their wine, and they can drink it any way that they like. Well, for those of you who love to drink wine in the so-called “proper” manner, then the $59.95 Chill Maintaining Wine Glasses might just do the trick. The Chill Maintaining Wine Glasses happen to be stemless wine glasses which will keep wine chilled between 32° F and 36° F for up to 30 minutes. 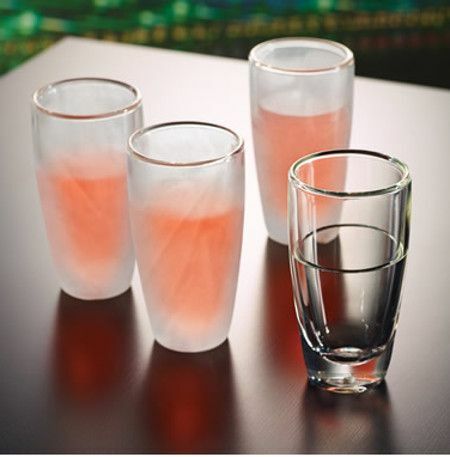 These happen to be double-walled glasses that sport a vicous cooling liquid located between both layers, and this liquid will freeze after an hour in a freezer, making sure that these glasses can chill a room-temperature libation to 36° F in a matter of just 2.5 minutes. The glasses themselves are made out from durable, borosilicate glass which can withstands temperature extremes of -22° F to 482° F, while their double-walled construction ensures that your hands will not end up getting too cold.